CME4PAC offers one year access to all of our online SA CME for a membership price of $49. The AAPA approved CME programs currently offered with membership can be found below. 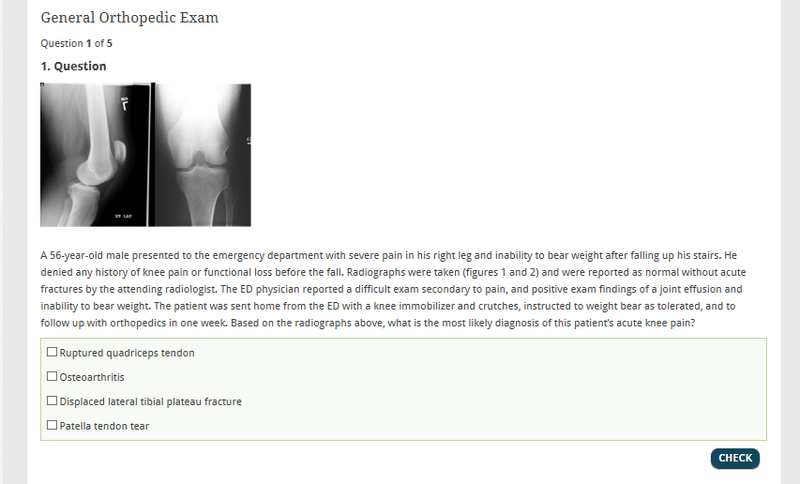 CME4PAC self-assessment exams are administered in a self-scored multiple choice question format. A discussion section with learning points follow each question. An example of how each self-assessment question will appear can be found at the bottom of this page. After purchasing a CME4PAC membership you will be prompted to set up a user name and passcode. Once logged in you will have access to all CME for one year. All CME programs can be found under the My Account tab once logged in. CME4PAC Membership Access- One Year $49.00 now. Below is an example of how each question will appear. Once you select your answer click “check” to view the correct answer and discussion. The correct answer will be highlighted in green. If you answer the question incorrectly your answer will be highlighted in pink. The discussion section and references appear at the bottom of the screen. To proceed to the next question click the “next” button.